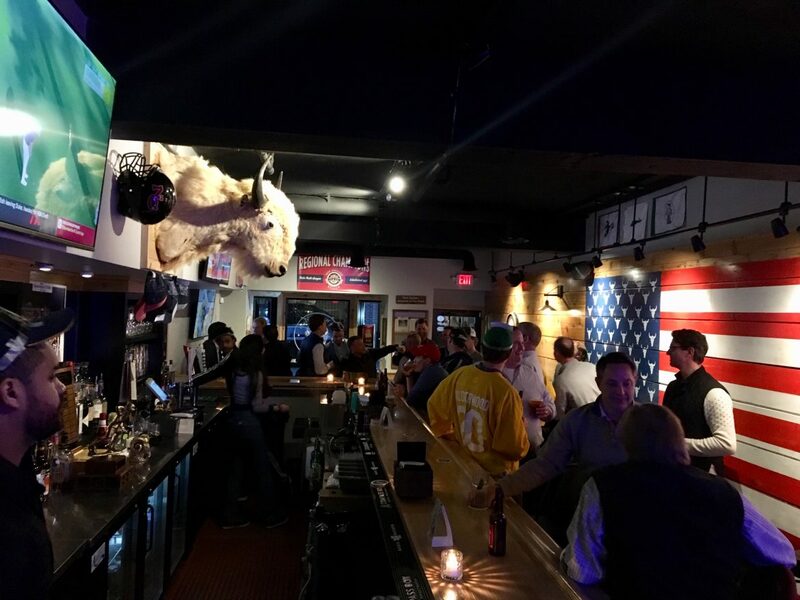 White Buffalo, a bar and restaurant that three town men opened last month down “the alley” at the top of Elm Street, is developing a strong following among locals during its early-going. Approved by the Planning & Zoning Commission last fall for its new restaurant use of a commercial space that had been used in the past for retail and music lessons, White Buffalo includes a 13-stool bar and rows of two-person tables that bring the total seating to about 40 people. 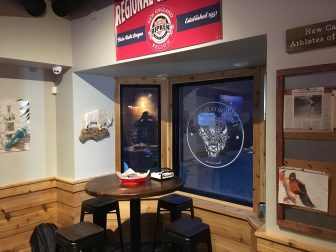 With a straightforward American sports bar-type decor that includes a prominent white buffalo head and large painted American flag that substitutes white buffalo heads for stars, the eatery’s menu includes traditional pub fare such as nachos, chicken nuggets, wings, hot pretzel and pizza, and is built mainly around hot dogs. Hot dog options include “Dog Day Afternoon” (jalapeños, bacon, cheese sauce and Cholula sauce) and “The Poochie” (guacamole, salsa, crema, bacon). 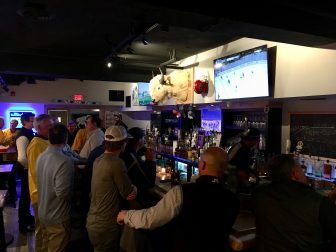 A recent weeknight at “the Buff” saw a predominantly male crowd of professionals, many of them locals, with some in softball uniforms, gathering around the bar while the Masters played on flatscreen TVs. 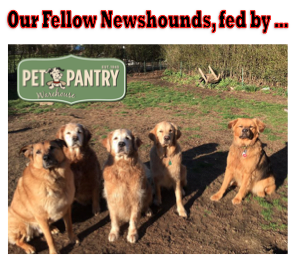 “Our clientele is thirsty for great drinks, a good bite and maybe a little play,” he said. Tonkovich added that Ommegang sells especially well among craft beers, and that its president is Doug Campbell, a New Canaan native and fellow NCHS ’93 grad. 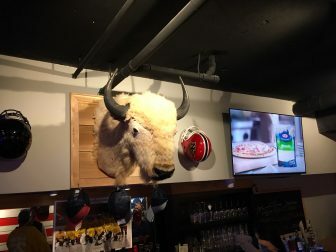 Just curious about the origins of the white buffalo hanging on the wall.